A Scouter is a wearable, all-purpose computer that measures power levels in the animated series Dragon Ball Z.
I was commissioned to make the a Scouter from Dragon Ball Z. Since this item is worn over the ear, it needs to be light. 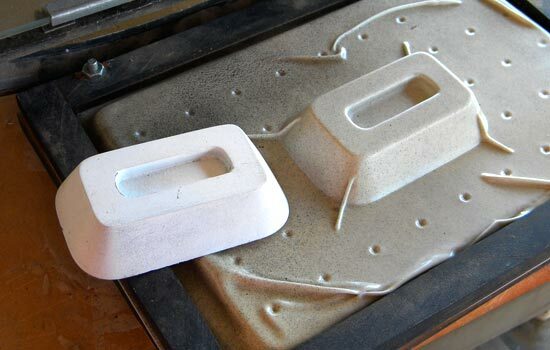 I made MDF masters for the parts of the Scouter so they could be vacuum formed out of plastic. A plastic body shell vacuum formed from the MDF master. I have a lot of webbing but I can clean up the corners so it’s not worth remaking. The lens arm after vacuum forming beside the MDF master. The yellow splotches are just paint drops on the scrap plastic I selected. The vacuum formed bracket that will support the ear padding. 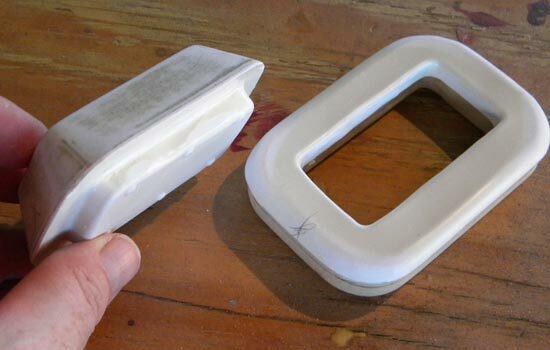 The padding bracket after it had been trimmed down for use. I filled the interior of the body and lens arm with blue insulation form. This supports the rather thin (.040″) plastic while adding very little weight. I stole the vinyl covered padding from a set of cheap Harbor Freight hearing protectors. A test fit of the padding attached to the bracket. Eventually I would glue down the edges of the vinyl to the top of the bracket. To attach the body to the padding assembly, I used the bracket itself to vacuum form a copy that would fit precisely over the bracket. I had to correct some warping that occurred to the bracket as a result of hot plastic pulled over it but it wasn’t too bad. The new bottom of the body glued in place. The body now fits tightly into the hole of the padding bracket with no glue needed. I assembled the Scouter parts and gave everything a coat of grey primer. 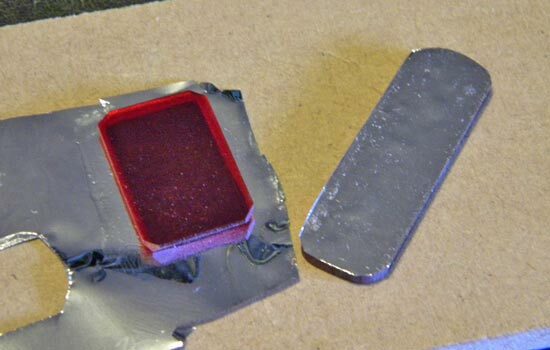 I also cut red acrylic for the side pieces. To attach the Scouter to the ear, I screwed an aluminum wire to the bottom of the body where it would stay hidden inside the padding. I cut the data lens from 1/8″ red acrylic. I heated the center with a heat gun and bent the lens over a MDF master covered with foil. I don’t know if the foil was necessary but I wanted to prevent the hot plastic from picking up any texture from bare MDF. A quick test fit of the lens inserted into a slot in the end of the arm. I left it unglued so the client could set it to a comfortable depth. To make the readout, I cut vinyl symbols to match a screen capture. I backed the red acrylic buttons on the side with silver mylar to brighten their appearance. The final assembled Scouter (after the body was painted with a glossy white). The back of the Scouter. Me in profile. Now I know how Lobot feels.